Republican presidential nominee Donald Trump said Monday that LGBT people should support his proposal to ban Muslims from the U.S. because Islamic groups promote violence against gays. “America must do more – much more – to protect its citizens, especially people who are potential victims of crimes based on their backgrounds or sexual orientations,” said Trump. In what is being called the worst mass shooting in U.S. history, American citizen Omar Mateen, 29, a security guard from Fort Pierce, Florida, entered an LGBT nightclub in Orlando at 2 a.m. Sunday and shot 102 people, killing 49 before police killed him. While Mateen called 911 during the attack and declared his allegiance with the Islamic State (aka ISIS or ISIL), President Obama said Monday there was not yet any “clear evidence” that the shooter was “directed externally” by any terrorist organization. Both Trump and Clinton delivered speeches Monday to address the implications of the Orlando attack. While Trump’s speech argued that the attack on the Orlando nightclub Pulse was the result of a “dysfunctional immigration system,” Clinton blamed it on a failure to restrict the availability of assault weapons. Mateen was able to shoot a large number of patrons at the Pulse by using an AR-15 assault rifle, a rapid-fire weapon developed for use by the military that can discharge up to 30 rounds per magazine clip. Federal law banned the sale of such weapons to civilians until 2004. 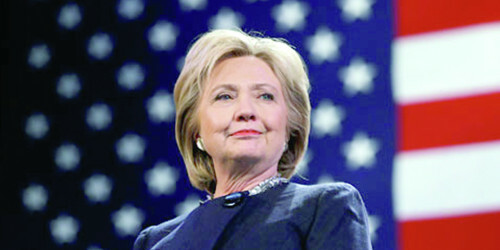 Clinton has expressed support for allowing 65,000 Syrian refugees into the U.S. in an effort to help alleviate “the worst refugee crisis since the end of World War II.” President Obama has called for the U.S. to accept 10,000 Syrian refugees. Trump has likened Syrian refugees to a “Trojan Horse” and said the U.S. should not accept any. The Orlando attack and the two major party candidates’ starkly different responses to that attack promise to ensure that immigration and gun control will be prominent issues in the presidential contest between Clinton and Trump. The attack will also likely focus continued attention on religious-based hostilities toward LGBT people. Numerous media outlets quoted Mateen’s father, Seddique Mateen, as suggesting his son had expressed hostility toward homosexuality and had been angered recently by seeing two men kiss. CBS News reported that Seddique Mateen had himself posted a video that showed him saying, “God will punish those involved in homosexuality.” But Seddique Mateen told CBS his son did not have the right to harm anybody. A friend of Omar Mateen told the Washington Post that Mateen was “quite religious” but never mentioned any allegiance to the Islamic State. Mateen’s former wife told reporters Mateen was not a devout Muslim. But the FBI investigated Mateen’s connection to a man at his mosque in Fort Pierce, Florida, who executed a suicide bombing in Syria. Media also reported patrons of the Pulse saying they had seen Mateen at the LGBT nightclub on several occasions and some believed he was interested in meeting men. Mateen’s parents immigrated from Afghanistan, but Mateen himself was an American citizen, born in New York and attended high school and a small state college in Florida. He had a state license to carry a concealed weapon, worked as a security guard, and had extensive training in the use of firearms.